Stable software with a variety of customizable options. Mobile app compatible with any iOS or Android device. Wide range of transaction options suited to Canadian players. Excellent tournament schedule that suits all bankroll sizes. The 888 brand is probably the most well-known in the world of online gaming. We covered 888’s online casino platform in our casino review section, and we had only good things to say about the service. This review will focus on 888’s poker room platform which has also maintained a spot as one of the leading online poker communities over the years. The great thing is that 888 is available to Canadian players so you’ll find the service easy to interact with in terms of payment methods and support. The 888 poker platform is also available as a mobile app so you have access to amazing poker action from wherever you are, and at any time. It’s also worth remembering that signing up to 888 allows you to move between their poker and casino sections with ease, meaning you get a huge amount of gambling entertainment from a single 888 account. 888 offers all the most popular poker types but might lack some of the lesser known variations. Overall there’s a decent choice with good traffic. The service is very used to Canadian poker players so the payment methods offered will suit your preferences for deposits and withdrawals. We really like the welcome offer at 888 Poker. There’s a 100% up to C$400 deposit bonus for a start, with a lot of useful tournament tickets giving you the chance to play for big pots for free. The 888 Poker room could do more in the way of promotions, but there are some great offers and a nice selection of tournaments. The support department at 888 is very professionally run. You can receive assistance in a variety of languages and response times are usually very short. The 888 Poker mobile app has slightly fewer options than some competitors but is high on poker action with a wide selection of rooms and an easy-to-navigate interface. 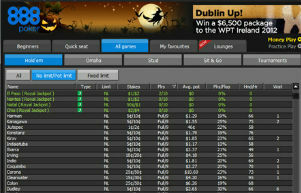 The 888 Poker platform is what you’d expect from a brand that is this well known. Everything looks great and is laid out in a logical way. It won’t take you long to understand how to navigate through the rooms and options, regardless of whether this is your first online poker experience. The mobile app is also impressively organized making it a pleasure to use when you’re not near a computer. 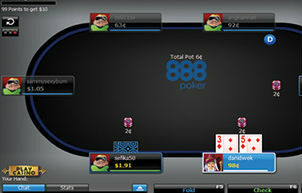 888 Poker offers all the most popular poker types including Texas Hold’em, Omaha, Omaha Hi Lo, and 7 Card Stud. Other lesser known poker variations are also on offer, but if you’re looking for a change of pace from the regular tables, a great option at 888 poker is to play a few hands in the live webcam rooms. You can also try out the lightning fast SNAP option which automatically sends you to a different table every time you fold. One of 888 Poker’s biggest strengths is probably its tournament schedule. It seems there’s never a dull moment at 888 and is the year moves forward there’s always an exciting tournament coming up with big prize money up for grabs. When you need a break from the intense poker action, 888’s amazing casino section is a click away. As we’ve described in our full casino review, 888 has an enormous selection of high quality casino entertainment. There are the traditional casino game types such as roulette, blackjack, craps and baccarat as well as a huge range of slot machines and arcade games. The progressive jackpots at 888 are massie, often way over $1 million. 888 Poker has been available to players from Canada for long enough to know what Canadians have come to expect in terms of a product and level of service. Because of this, you can expect to find interacting with the service to be a straightforward and professional experience. There’s a huge selection of banking options at 888 Poker form all the major credit cards to a wide choice of online transfer services and other payment methods. You should have no problem finding your preferred payment method here and the same goes for withdrawals. At 888 Poker, all new sign-ups can make use of the special welcome offer. The offer at 888 Poker is actually a package made up of a number of excellent benefits that will let you enjoy more poker action for less money. How Does the 888 First Deposit Bonus work? The first benefit is a 100% bonus up to $400. So if you deposit $10 you get to play with $20; deposit $100, play with $200 etc. Note that the welcome bonus is paid out in a certain way: you get $10 payments each time you collect 100 bonus points. The bonus points are collected by playing real money poker and casino games. The 888 brand is an industry leader and it only makes sense that the support department follows suit. You can contact 888 Poker via online chat, email, or telephone. The support team can help with any technical issue you may have with the site, making a transaction, or any other type of problem. By joining 888 Poker you of course also gain access to the 888 Poker mobile app. The app is a great combination of poker action and ease-of-use. You;ll have no trouble figuring out how to navigate through the various rooms and features. Playing poker at 888 Poker is a smooth and enjoyable experience. There’s a great tournament schedule and big prize money to be played for. The mobile version of 888 Poker is easy to use without any learning curve at all, and the added benefit of gaining access to 888’s huge selection of high quality casino games is a big deal. The welcome bonus itself might not seem like a huge figure off the bat, but when you look into it you end up getting a lot of poker play value at a low price, and access to those great tournaments, so as a package it’s definitely a winner.